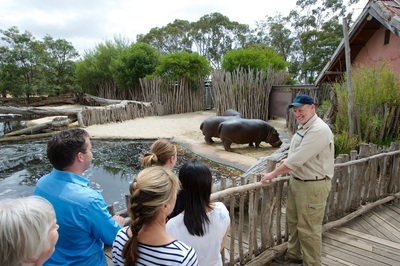 Hang out with the Hippos at Werribee Open Range Zoo, with a brand new daily keeper presentation. Hippo Beach is undoubtedly a favourite for Melbourne families, with it's diverse outdoor play area for children; sand, water play and playground, right next to the Hippopotamus' enclosure. There is even more reason to head to Hippo Beach at Werribee Zoo, because the new Hippo zoo keeper presentation will begin every day at 1:10pm, from 1 April, 2017. Keepers will provide you and your family with an insightful talk into the behaviours, care and unique personalities of the hippo group at Werribee Zoo. Beginning with a health check, where Keepers take a good look at each hippo’s teeth, tusks and gums, this special presentation also includes a feed on the beach, with hippos emerging almost soundlessly from the water to forage on the banks. 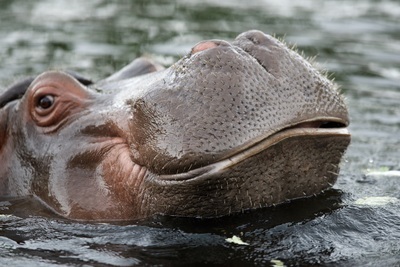 The hippos' gentle and playful character can often be masked by their reputation as being one of the most dangerous animals in Africa due to their territorial nature. Now is your chance to see the other, more docile, side of Africa's extra large, mostly herbivorous mammal. Able to hold their breath for up to five minutes and create their own sweat-based sunscreen, they also have some remarkable adaptations that make them unique in the animal kingdom! Hang out with the Hippos at Werribee Zoo this Easter, and enjoy the rest of Melbourne's most fabulous open range sanctuary, spotting Rhinos, Lions, Zebra, Giraffe and Meerkats, too. See also: New Lion Cubs at Werribee Open Range Zoo article by Cate.